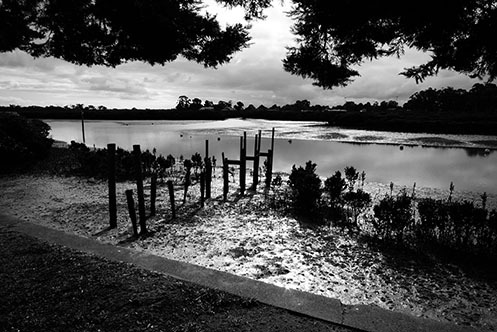 The view across Sawtells Inlet, looking towards Tooradin Village. 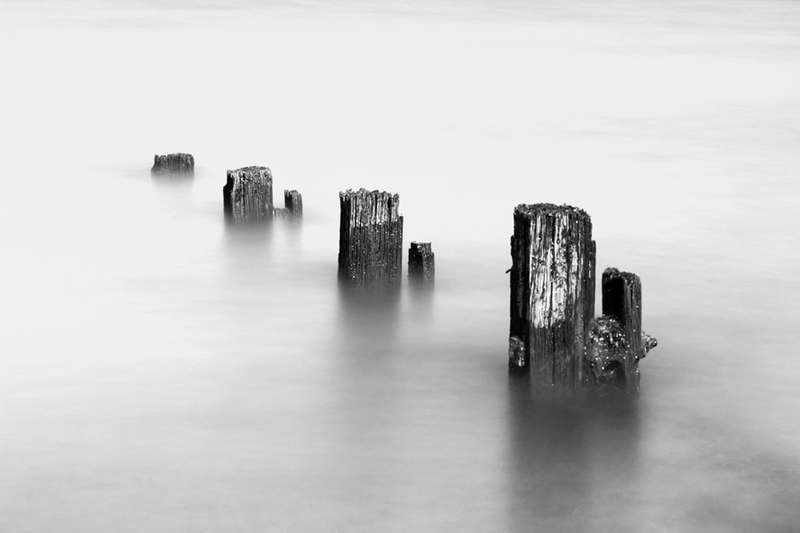 Tech stuff – 10 seconds, f/13, ISO 100, 10 stop solid + 4 stop soft grad ND filters. 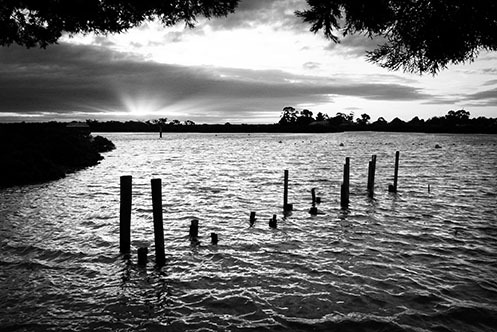 A boat ramp at Coronet Bay creates leading lines to the setting sun. A couple of images taken as the sun disappears below the horizon at Tooradin foreshore, Western Port Bay. Pictured below – At high tide a mangrove sits semi submerged in the foreground as day gives way to night. 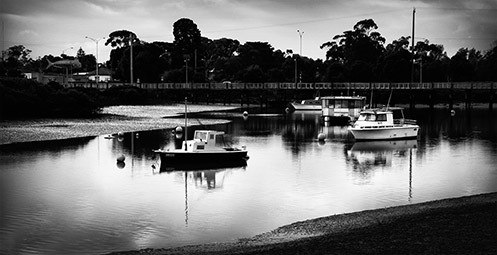 Below – A view from the Tooradin jetty looking back upstream towards town. Following are a series of images from Queensferry, on Western Port Bay, demonstrating the area’s vast difference in appearance between high tide and low tide. The high tide images were taken using my 40D with heavy ND filtering. 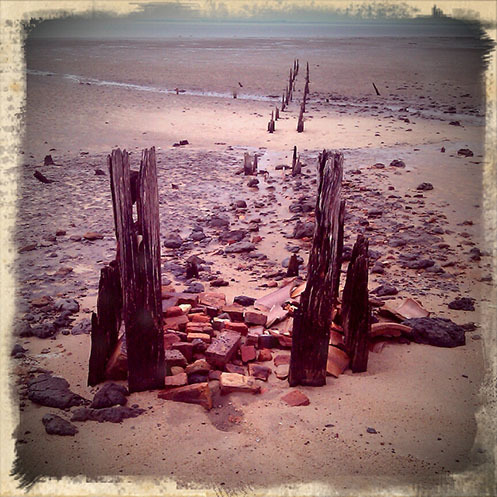 The low tide images were captured a week earlier (as reference photos) using my phone camera and post processed using an Android app called Retro Camera. A high tide view of the docking station at Corinella. This is where the French Island barge docks to transfer vehicles and passengers to and from the mainland. 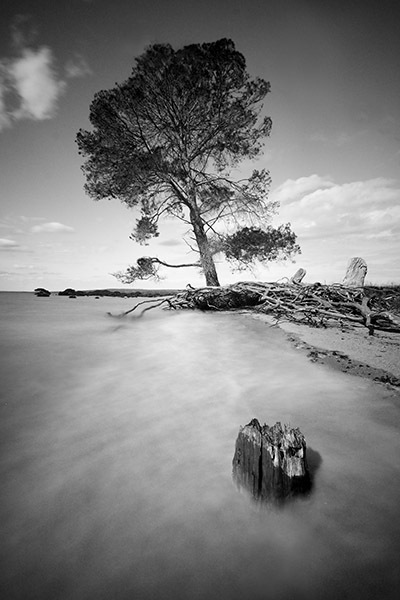 Below – Old Man of the Sea, an old mangrove tree just a stone’s throw away from the docking station. Tooradin is right at the top of my list when it comes to escaping for a little bit of quiet time. 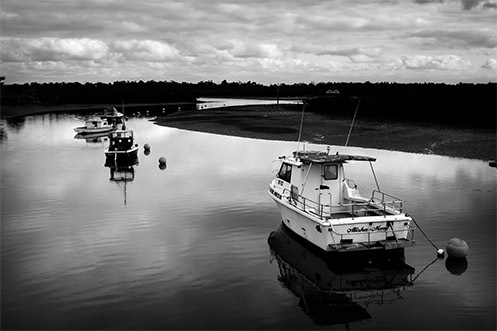 Located just a few minutes down the road from my home, Tooradin’s features include a serene creek that runs through the town and winds it’s way down to a great foreshore area where it joins with Westernport Bay. The foreshore area usually has lots of parking spaces available and serves as a fine place to devour whatever delicacy you’ve chosen from the local bakery, fish and chip, or pizza shop. Alternatively you can bring along your own boring food and make use of the BBQs. 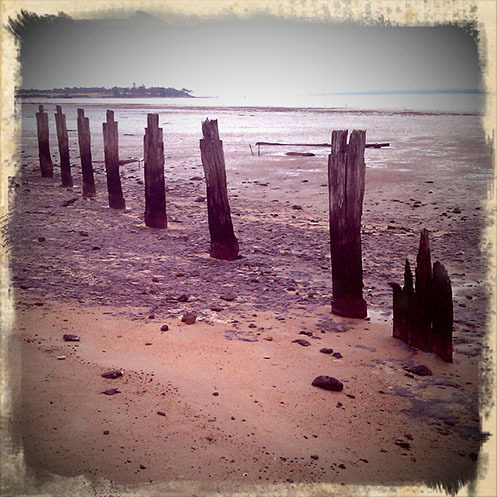 Pictured below – The view looking down the channel towards Westernport Bay at low tide. During low tide, large expanses of mud are exposed along both sides of the channel. You can stroll along the elevated edge of the channel and watch as thousands of tiny crabs, disturbed by your presence, dive for cover into their tiny holes in the mud. Pictured below – The view looking up the channel towards the main road. Back to the serious topic of food for a moment, I highly recommend the Tooradin bakery with it’s fine selection of meat pies. They also have more sweet cake/bun/doughnut thingies than you could poke a stick at, …..and the coffee isn’t too bad there either. Fish n’chips must be big business in Tooradin because this tiny town has no less than two fish n chip shops. On one side of the main road is the Tooradin Original Fish & Chip Shop and across the road is the Boardwalk Chippery. The Boardwalk shop boasts the use of “healthy rice bran oil”. The rice bran oil must be an acquired taste, …I’ve tried it but I haven’t yet acquired that particular taste,….but each to their own. Pictured below – Down the channel a short distance, remnants of the old jetty pictured at high tide, complete with “god rays” shooting through the clouds signaling the end of a beautiful day. For the curious photographers who might be reading this post, the camera I used was a Panasonic Lumix LX3 in “dynamic B&W” mode with some minor corrections later in Photoshop. 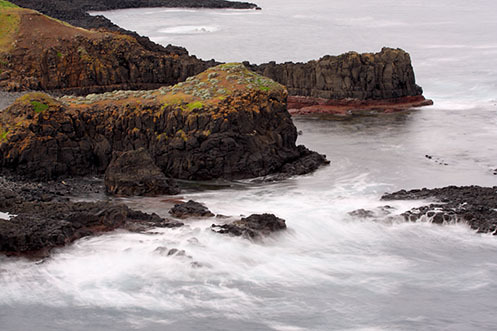 Magic of the Phillip Island coastline. Following on from previous posts I thought I’d share with you just a few more images from the Phillip Island coastline. I feel like I’ve just scratched the surface down there, …….there’s just so much beauty to explore and discover. 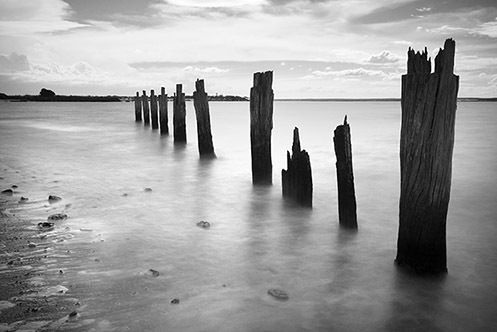 Pictured below – The Roost – old jetty remnants that serve as a safe roost for the local birds at Cat Bay. Pictured below – Evidence of Life – a soft misty view of some wonderful wave action off Cowrie beach. Pictured below – The Long Swim Home – another view from Cowrie beach looking towards the Nobbies in the background. 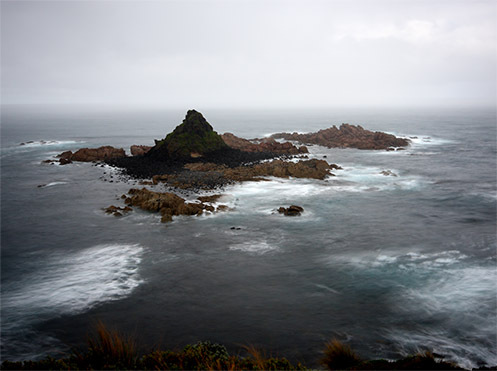 Pictured below – Pyramid Rock, taken in strong windy and wet conditions from a vantage point ahead of the lookout area. I’m dedicating this image to the recent passing of Rapture Day, May 2011. Never has such a silly idea generated so much noise in the media and on social networks. Pictured below – In Lieu of Rapture. 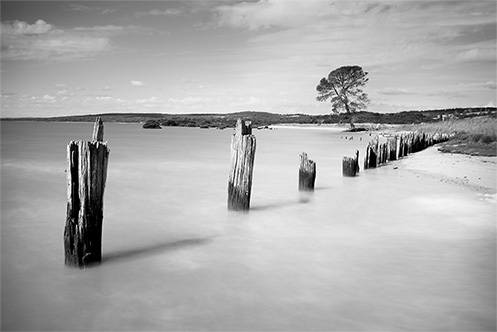 The image was captured at Cat Bay on Phillip Island. 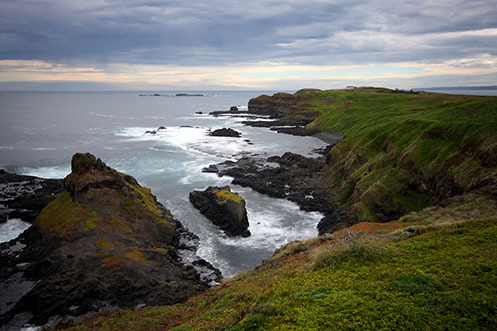 Over the weekend I did a quick reconnaissance trip down to the pointy end of Phillip Island. The images below were taken on a stretch of unsealed road named “The Boulevard” which runs along the south coast of Summerlands and ends at the Nobbies. The Boulevard is a grand name indeed for what amounts to a narrow dirt track, however the coastal views can be quite impressive from here. 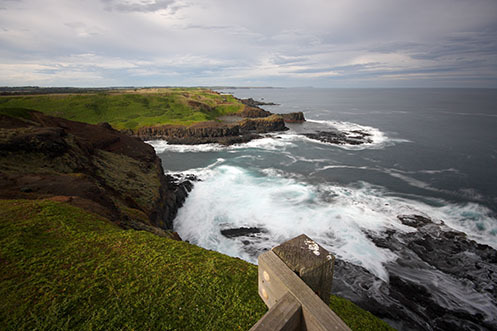 Pictured below – The view from The Boulevard looking west towards the Nobbies. Unfortunately for those of us who like to immerse ourselves in these kinds of coastal environments there is no beach access permitted. We’re reminded of this fact by strategically placed signs warning of penalties for such breaches. Pictured below – The view from The Boulevard looking east. Pictured below – a zoomed in view of the coastline. It looks like a fine place for a photographer to play. When finished with the south coast I made the short trip over to the north coast to visit Cowrie beach. I’ve been here once before but I had some unresolved images in my head that I wanted to try to capture here. Most of the northern coast is photographer friendly, allowing one to get as close to the water as one dares. Pictured below – Bull in a China Shop, one of the less sedate Phillip Island waves attacking from left of frame. Pictured below – A long exposure image using an ND400 filter, The Course of the Penguin, one of the many corridors used by the penguins of Phillip Island. After finishing at Cowrie beach I left the island and crossed the bridge over to San Remo on the mainland. As I was crossing the bridge I noticed some amusing looking stairs below, surrounded entirely by the water of a high tide. It appeared to be a stairway going from nowhere to nowhere. 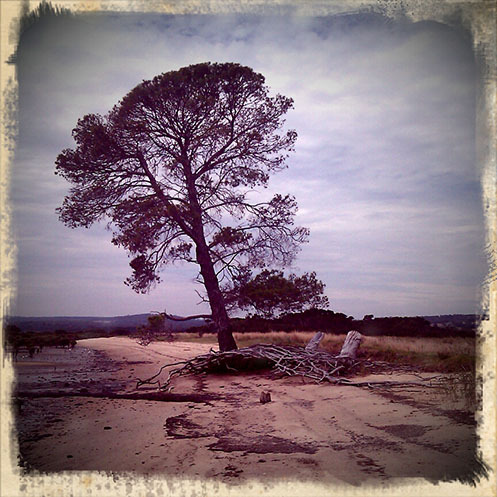 Pictured below – From Nowhere to Nowhere, San Remo. The day concluded with a delicious meal of fish n’ chips from the Fisherman’s Cooperative, …..what bliss! I have mixed feelings about the changes being made to the coastal village of Warneet. Many of the grand old pine trees along the beachfront have been cut down and it appears that the main dirt roads are being surfaced. Progress, …..I guess. 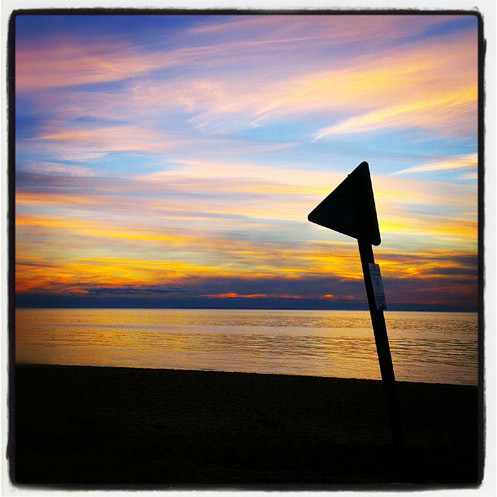 Pictured below – Downtime – An iconic landmark (watermark) at Warneet coastal reserve. Pictured below – some of the locals. 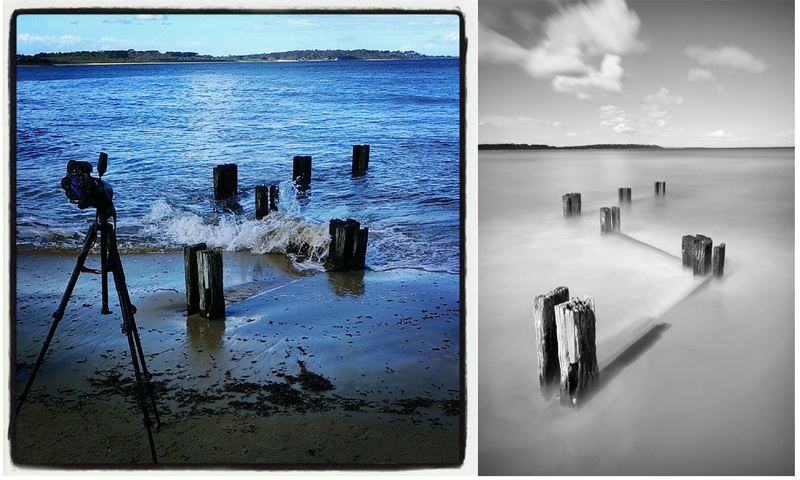 Following are some images from the shores of Westernport Bay. 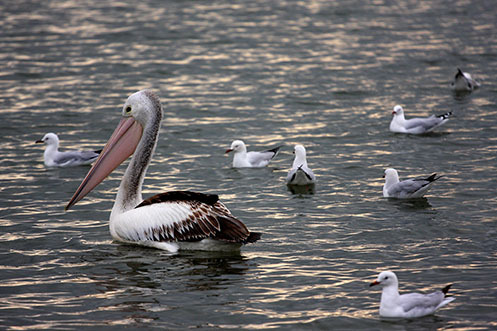 Pictured below – The Journey Home, seagulls at the Tooradin foreshore take off en masse as the day gives way to night. Below – Corinella Sunset, a series of “God beams” appear from behind a cloud as the sun sets at Corinella pier. These “God beams” are also known as crepuscular rays and are explained at Wikipedia here. 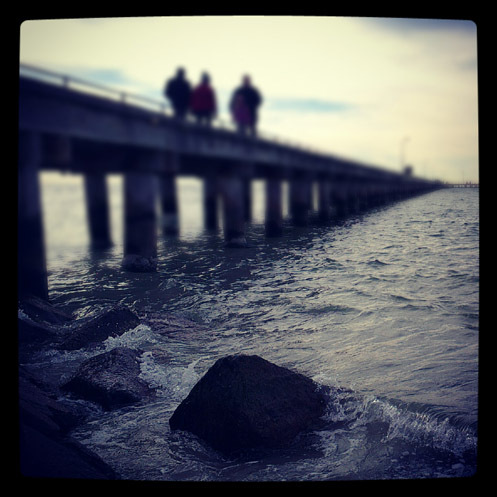 Below – The Living Jetty. 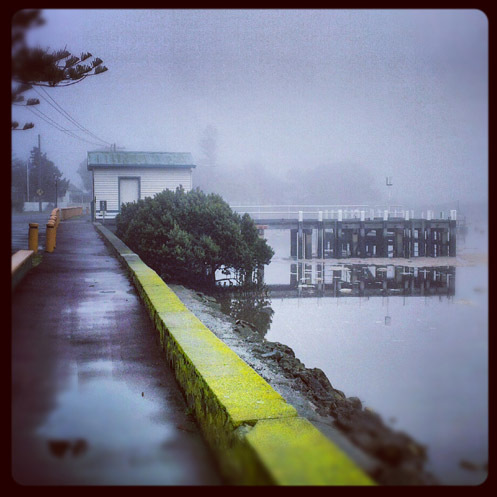 At Corinella a jetty platform disappears below the surface during a king tide. 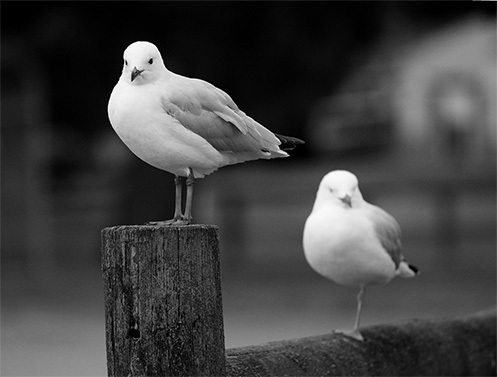 The local sea birds take advantage of the exposed posts by using them as a safe roost. Below – The best position for overseeing the activities at the Corinella jetty area. 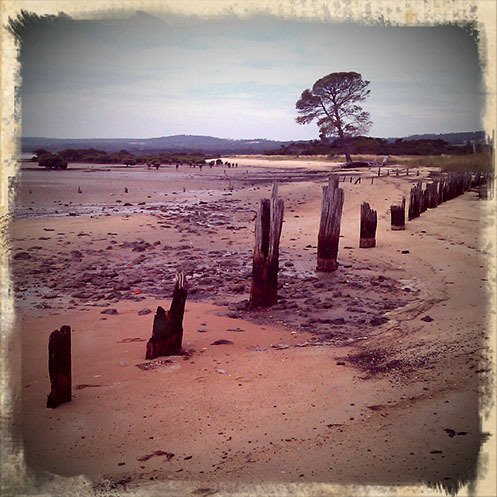 An Afternoon at Cowrie Beach, Phillip Island. Cowrie Beach is located just a few hundred meters north-east of the popular tourist destination “The Nobbies” on Phillip Island, Australia. The beach sits just inside the entrance to Westernport Bay and is subjected to rough surf originating from Bass Strait. The thinly vegetated sandy portions of the beach are home to Fairy penguins and some other more endangered species so there are signs present advising which areas to avoid. The main attraction here from my perspective is at the water’s edge. The beach is blessed by the presence of dark basalt rock formations continuously pounded by waves. Below – The Nobbies – an image from Cowrie beach with The Nobbies in the background. Below – Down the Winding Path – a long exposure looking out to sea from Cowrie Beach. Below – Awaiting the Devil – a frightening part of the beach where unexpected waves suddenly inundate the dark basalt platforms. 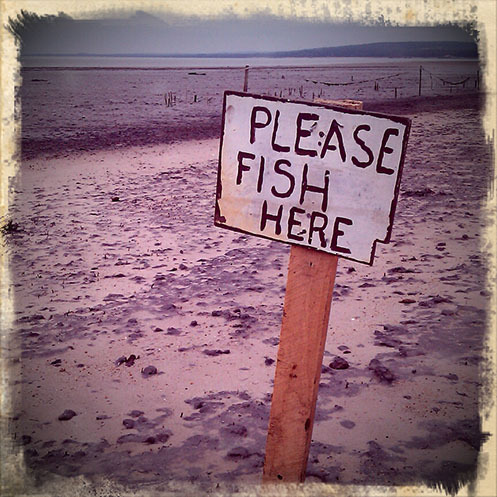 There’s a warning sign on the beach reminding fishermen and other visitors how easy it is to be swept off these rocks. Below – The Ordeal – How the Phillip Island penguins manage to survive the violent Bass Strait surf combined with rocky beaches escapes me. Saturday’s excursion to Phillip Island turned out to be very rewarding from a photographer’s perspective. In the late afternoon I stopped at a place called Right Point, which seems to be a very popular destination for surfers. As I peered over the edge of the cliff towards the beach I instantly fell in love with this spot. Below me were the remains of an old jetty being pounded by the violent surf. With the sun starting to drop towards the horizon what more could a photographer ask for? As the sun dropped even closer to the horizon a good situation became even better when suddenly Crepuscular rays broke through a gap in the clouds. Crepuscular rays, also known as “God rays” or “God beams” are explained here. On excursions where I’m near a bridge or pier, my inner troll has a tendency to take control and drag me under. Sometimes the results are quite pleasing. Strangely enough I often find the underside to be more photographically pleasing than the top side. Below – “Gateway” the underside of the San Remo bridge. 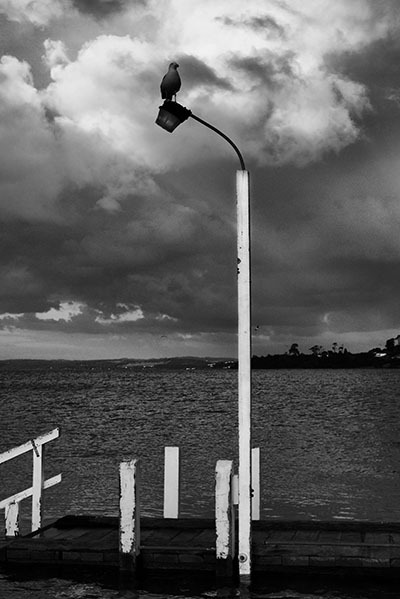 Below – “San Remo Bridge” the gateway to Phillip Island, Victoria, Australia. Below – “Dromana Downunder” the underside of Dromana pier. No trolls under here!